In some cases, buyers may want to purchase a home without going the traditional bank lender route. In this situation, rather than obtaining a mortgage from a commercial lender they can instead turn to the home seller. Deemed ‘owner-financing’, in this situation, the money to purchase the home is borrowed from the seller rather than a bank or other lending institution. Why Buy a Home Without a Lender Via Owner Financing? 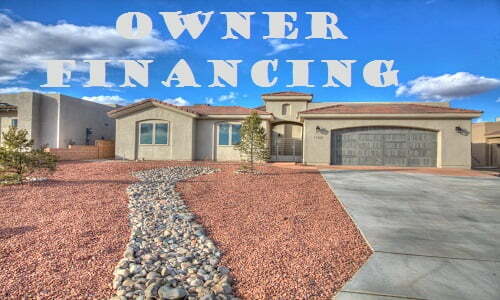 Owner financing, also called seller-financing, can be advantageous for both buyer and seller. When owners have difficulty finding a buyer or a non-traditional home poses financing issues, owner-financing can offer an ideal solution, generating income and facilitating a faster sale. On the flip-side, for buyers having difficulty securing traditional financing due to salary predictability (such as contracting work), employment changes, or a lackluster credit score, owner-financing can offer hope for a home purchase. Seller-financing also offers buyers the added benefits of less stringent purchase requirements, a faster closing process with lower closing costs, and more flexible down payment options. Most owner-financed homes are short term. The amount typically financed is between 20-50% of the purchase price of the home, including a large ‘balloon payment’ at the end of the term for the balance. Why the balloon? After 5-10 years, the buyer is expected to refinance the loan through a traditional lender, paying the seller the balance of the loan in full. (It’s typically not in the best interests of the seller to carry the loan over 30-years.) This means you should plan to qualify for such a loan at the end of the contract terms, consulting a tax professional or credit counselor on ways to ensure your credit score will be high enough to qualify well before the balloon payment is due. If the home is not owned outright with the title held free and clear, permission from the current owner’s lending institution is a must before moving forward with owner financing. It is wise for both seller and buyer to perform background checks on each other, including credit history, employment, and references, before moving forward. If the buyer/seller is financially irresponsible, this could indicate an increased risk of mortgage default. What professional assistance is best? It is best for both buying and selling parties to hire their own licensed appraiser to value the home to ensure a price that is fair to both parties. Both parties should also enlist the help of an experienced real estate attorney to protect their interest, as well as draft necessary inspection/offer/purchase paperwork. A licensed RMLO can provide advice on the loan interest rate and terms, as well as constructing a clear, binding financing contract that is compliant with today’s multitude of buyer safety legislation, including the Safe Act and Dodd-Frank Act. Though lower than state maximum allowable rates. Clear title report and inspection requirements. Including the final sales price, loan length, payment schedule, and balloon payment total at the contract’s termination, as well as the preferred title insurance company. The terms should also include what will happen in the unlikely event of default. Who will pay the escrow fees for an intermediate service to accept payments, tax, insurance, provide a history, and hold the deeds until the contract is complete? The seller’s real estate attorney will draft loan documents, with the buyer’s attorney reviewing before both parties sign. NOTE: The buyer may wish you to sign a promissory note (your promise to purchase the property at the discussed terms pending the drafting of loan documents), to be entered into public records, prior to moving forward with the final documents. This protects both parties. File mortgage/deed of trust paperwork at the proper city/county land records office, making the deal official and ensuring tax deduction advantages. Buying and selling parties in owner-finance deals are often involved in complicated situations. Painting an honest picture as to why owner financing is offered/needed, as well as an in-depth discussion on financing terms are essential. Enlisting the help of experts aids this endeavor, with professional assistance lending credence to the cause. This ensures a smooth and amicable process for both parties, securing the successful future of the owner-financing deal.